Millions of residents are painfully familiar with tiny kitchens of paneled high-rise buildings with an area of nly seven square meters. However, in fact, your working area and dining table should be located there! Many people cannot imagine how you they can make such kitchen more spacious and comfortable. But, yes, it is possible, especially if you hire professionals to do it for you. A solution can be modern kitchen remodeling. With competent approach, you will be able to transform one tight room and make it as convenient and functional as possible. So, where to start? It all starts with a fact you need to decide what type of repair you need - capital or cosmetic. Cosmetic means updating appearance of room and correcting current shortcomings. We will talk in this article about the remodeling, which implies complete transformation of these premises. When kitchens are small, their remodeling causes great challenges. How to fit all your necessary furniture and household appliances in small area, so that there is still enough free space for cooking? Kitchen in white tones. Traditional option, which is always win-win. Light colors are attractive in that they allow you to visually expand it. White color visually extends walls, creates a sense of spaciousness, and even small kitchen begins to seem bigger. Glass and wood. Modern version of the interior, which is good in that it also allows you to visually expand a space. Glass doors create feeling of lightness and increase room’s volume. Wood also warms up the interior. Natural wood. Furniture, for example, from maple can be an excellent solution for kitchen interior. The maple is not quite white, but its light shade looks massive. It is warm enough and cozy. Do not seek to fill your kitchen with many home appliances and furniture, leave only those that are necessary. These are refrigerator and microwave, and also a table, stove, sink, pair of chairs and desk. Small objects, such as mixer or blender, we do not think are always necessary. Make continuous work area, that is, connect you refrigerator, sink, desktop in one continuous line, and place the food table separately, for example, in a corner where it will occupy less space. Decorating elements and all kinds of patterns cannot be applied everywhere. The print on cushions under the seat, small strokes that will not "spoil" the kitchen - this is the maximum. Use light colors - this will visually expand cramped kitchen. Curtains can be bored or do not fit the new design of the small kitchen. Then it is better to use blinds. It is easy to find one on the local shops. 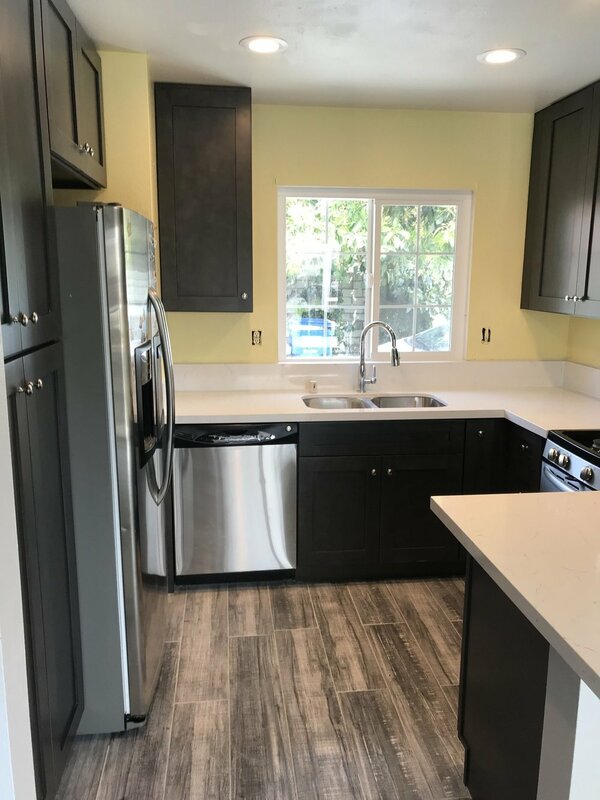 Remodeling of small kitchen will not be a problem, but only if you involve in the whole process experienced and intelligent construction specialists. Up Next: Where To Start When You Are Remodeling Your Kitchen?